It’s okay. You’re not alone. We’ve all created a landing page that didn’t bring in the results we wanted. Even experts miss out on potential conversions from doing a little thing wrong in their design or copy. Fortunately, you can become an expert in landing pages. Sift through these amazing resources and you’ll have expert knowledge in no time. The average entrepreneur doesn’t need 10,000 hours of experience to make successful landing pages. You just need to learn from the experts that have spent that much time. And that’s why I created this post. This huge list includes resources, tools, strategies and case studies that will bring you up to speed - fast. Are you ready? Let’s go. The Landing Page Building Links That’ll Make You an Expert - Fast! Learn the ancient, three-step art to creating compelling landing pages. Discover the best lead magnet, according to tens of thousands of data points that Clay Collins points out. Take a note from Oli Gardner about form-first landing page design. Tim Ash believes landing page testing is the best accelerator for your business. Check out why he believes that. Copy the strategy Moz used to bring in $1 million from a single landing page and a few emails. Get the recipe for the perfect landing page, thanks to British Design Experts. Make your copy irresistible with these 20 power words that will electrify your online advertising and marketing efforts. Do something different from the competition with these unique strategies. Take these three steps and use optimization to increase conversions by 400%. Dodge rookie mistakes by learning these 50 best practices. Declutter your pages for a 225% increase in conversions. Feature an image of a person for 102.5% more signups. Use bigger pictures of your product for a 9% sales lift. Create a better value proposition for 123% more registrations. Put your call-to-action in a prominent place to increase conversions by 591%. Help your customer make a decision by including reviews/testimonials. And increase your conversions by 35% in the process. Make more money by redesigning your pricing page. Take advantage of a friend for a fresh set of eyes on your page. Realize the real problem and increase conversions by 3000%. Stop losing out on potential signups by making your landing pages mobile friendly. Rethink your design strategy and see more success, like GrooveHQ. Don’t miss the most entertaining guide to landing page optimization that you’ll ever read. Wield the power of social squeeze pages. Use these 3 steps for customized landing pages. Take a play out of a pickup artist’s handbook for creating pages that entice your visitors to convert. Seal the deal with these 10 tips for writing the perfect copy for your landing page. Drive action to your offer by using these 10 tips from David Meerman Scott. Figure out what’s making your visitors leave by using a tool like Crazy Egg. Uncover ten incredibly stupid landing page blunders that may keep you from making the impact you desire. Follow these 7 rules that Jonathan Mendez shares about optimization. Turn traffic into money using the skills that Copyblogger discusses in its landing page resources. Understand the basic principles of effective landing page development. Use Themeforest’s massive collection of HTML templates for a quick, easy and professional design. Or select a template from one of these 35+ hand-picked options. Read these 22 brutally honest critiques and evaluate how your designs measure up. See which small tweaks can make a huge difference in your success. Optimize your pages for paid traffic. You’ll get better conversions, engagement and bang for your buck. Increase social sharing by 3600% by installing one simple plugin. Come to terms with the fact that sometimes bigger IS better. Learn how long you should make your forms. Then make $12 million more than usual by removing one field from your form. Or, more attainably, remove a few fields and increase conversions by 10.48%. Create trust with these two superhero landing page strategies. Learn how to maximize conversions using A/B testing. Analyze the anatomy of a perfect landing page and incorporate it into the pages you’ve already built. Optimize pages based on different sources of traffic. Understand what elements you should test on your pages for maximum conversions. Read this guide on effective SEO landing pages for beginners. Or beginner’s can use this guide for PPC landing pages. Once you’ve created the pages, use this beginner’s guide for landing page optimization. Sift through this impressive 12-chapter guide on conversion rate optimization. If you’re in a hurry, use these five quick-tips for better design. Distinguish art and applied art for increased conversions. Understand modern design trends and apply it to your design and development process. Fix your website so that it stops hurting your sales. “The Fold” is a myth. Learn where you should actually put your call-to-action. These ten best practices will help you succeed with mobile landing page optimization. Write great mobile landing page copy using the tactics outlined in this article. Dig through these quora answers to learn about viral landing pages. Make your landing page shorter for a 13% lift. Understand the seven principles for conversion-centered landing page design. Watch Hubspot review and analyze 60 landing pages in under 60 minutes. Increase conversions by 161.66% by just changing one word. Use Unbounce’s authoritative, definitive, essential and ultimate collection of 101 landing page optimization tips. Stop being so generic and you could increase sales by 22%. This infographic shows you the complete guide to successful landing pages. Read a 20,000 word guide on landing page conversions. There you have it. 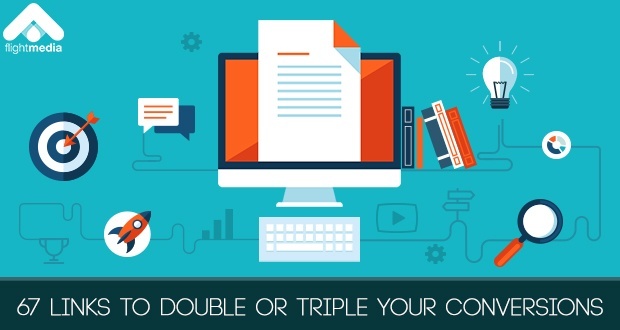 67 links that will help you double, triple, perhaps even quadruple your conversions. Dig into these hand-picked resources and you’ll have more of a grasp on landing pages than most business owners and entrepreneurs. Success happens when you combine knowledge with action. Pick out a few of these strategies and tactics for your next design. You’ll know which ones feel right. Test those first, then test others. And if you found this resource list helpful, please share it on your favorite social media channel. I’d really appreciate it!